30 April 2015 | LIMA, Peru | The alpacas of Peru are prized for their soft, fluffy wool, and farmers have been raising them on the steeppuna grasslands high in the Andes above Lima for millennia. Alpacas also have soft, padded hooves; the bottoms of their feet are more like house slippers than like street shoes, which means they can plod around on the grass without stampeding the absorbent dirt into an impenetrable hard surface. Cows and sheep, however, are a different animal completely: their hard hooves compress the dirt, and when they graze, they yank the grass out of ground rather than snipping it with their teeth the way alpacas do. This all results in grasslands that repel water rather than absorb it, contributing to a feast-or-famine cycle in Lima, which is the world’s second-largest desert city after Cairo. In the wet season, the rivers that flow down from the Andes break their banks, while in the dry season, they slow to a trickle – and those cows and sheep are one reason for that. On top of that, the soils are carbon-rich, and as they’re degraded, carbon is released into the atmosphere. Then there are the natural swamps and bogs that, like the soils, have traditionally absorbed water in the wet season and released it in the dry season. Over the last century, they’ve been drained so animals can graze, and that makes the downstream wet seasons wetter, and the dry seasons even drier. Earlier this month, the city’s water utility, SEDAPAL (Servicio de Agua Potable y Alcantarillado de Lima), announced it would funnel nearly 5% of the water fees it collects from users into addressing this issue. Some of the money will go into programs that help farmers better manage their livestock – in part by rotating their animals, but also by keeping fewer – but fatter – cows. 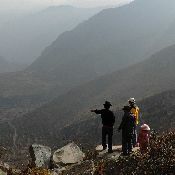 Other funds will go to close the drainage ditches so that wetlands can replenish their stored volumes, and deep infiltration of surface water regulation processes will recover, while some will go to restore pre-Incan “amunas” that siphon water off high-altitude streams in the wet season and funnel it into the mountain itself, where it filters down through the rocks over several months and emerges from springs in the dry season. Of the activities, restoration of amunas will likely provide the greatest impact and at the lowest cost, according to a cost-curve analysis carried out by Ecosystem Marketplace publisher Forest Trends and Consorcio para el Desarrollo Sostenible de al Ecorregión Andina (CONDESAN). The restoration of amunas will provide nearly half the dry-season water increase. Source: Forest Trends and CONDESAN. The funds will be divided between two activities: 1% of the total water tariff, or PEN 70 million (USD 23 million), will go explicitly to green infrastructure; while 3.8%, or PEN 266 million (USD 89 million) will be used for climate change adaptation and disaster risk reduction more generally. The PEN 70 million investment is more than any other Latin American city or water utility has ever committed to green infrastructure. Lima’s challenges are far from unique. Due to extreme water shortages, California is imposing dramatic water use reductions and, as a result of an extreme drought, São Paulo, Brazil, the world’s fourth-largest city, is contemplating similar measures. The water crisis is front page news every day these days – and Lima is taking a very important and big step into the right direction. SUNASS tentatively approved the proposal on March 26 followed by a public hearing that took place this month. Based on the public hearing, SUNASS anticipates it will be approved next month with no changes to green infrastructure and climate change adaptation funds. Lima’s water utility, SEDAPAL, had submitted a proposed budget that included a plan for investing PEN 12 million (USD 4 million) in green infrastructure for the city. The approved budget is nearly six-fold that proposal.